Awesome Moon and Star Baby Shower Decorations & Ideas! 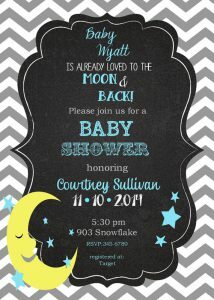 Another great baby shower theme idea is the moon and star baby shower theme. It has a sweet and soft feel to it. And you can get really creative with moon and star baby shower decorations. 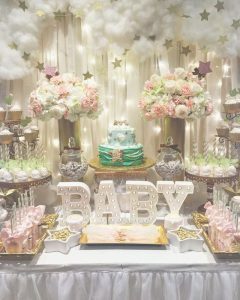 Love this soft pastel theme, with cotton clouds, and twinkled lights in the background. Fresh flowers in vases and lit BABY marquee which you can get them here. Lastly it can also be the sun and moon theme for the Yin & Yang. 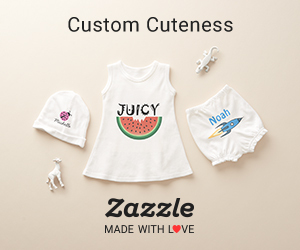 There are not as many moon and star baby shower decorations as other baby shower themes, however you can always DIY some of them. 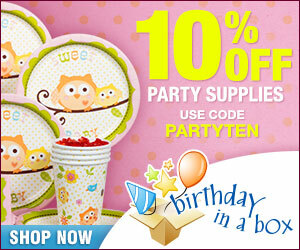 Use blue and yellow or gold as the color of decoration for boys, yellow (gold) and pink for girls. Here are pretty cutouts that you can glue to a sting and hang them as garlands. Easy to make and not expensive. Hang them on the wall or in front of the buffet or candy table. You can also make these and hang some stars from the ceiling. If you are looking for cheap way of decorating a room balloons, pom poms and streamers are a good way to go. You can also find mylar balloons in shapes of stars and moons to add to the theme. You can make a large sign with cardboard paper in a big shape of a moon and add some sparkly stars. 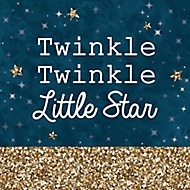 (TIP: you can buy a nursery wall decal and stick it on a large paper (or plastic) and use it as a banner or photo booth). Lastly, you can have confetti as decor on tables, or you can use these confetti as cupcake toppers (just add a stick)! 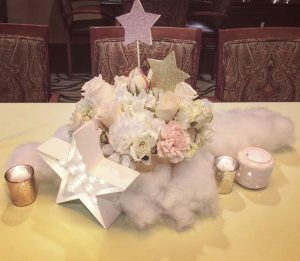 Recreate this beautiful centerpiece with fresh flowers in a vase, add few glitter star picks, some white material for clouds, few candle holders and a nice star light ornament to finish it off! 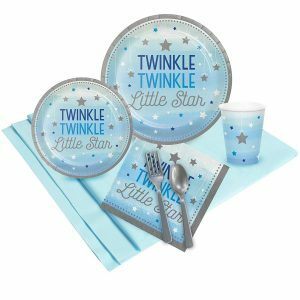 Here is a list of twinkle twinkle little star decorations and tableware. 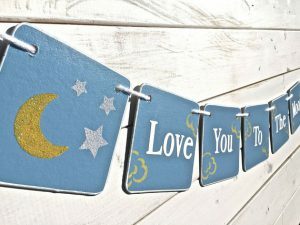 Also you can find here the I love you to the moon and back baby shower theme decor. Go more sophisticated with these gold and white tableware. These are really unique and not found anywhere! Lastly if you like the love you to the moon and back theme here is a party pack you might like to grab for your next shower. 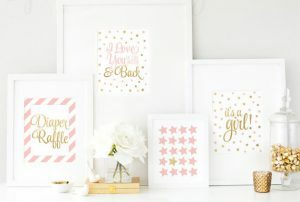 If budget does not permit, you can also get printable baby shower decors such as these. A theme favor is not always require, but if you do find them, why not! Here are few that might give you some ideas. 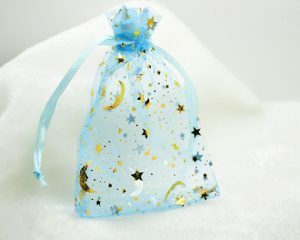 Or you can DIY baby shower favors and pack them in these pretty organza bags. Food for this theme can be quite cute to make. Bake a cake or cupcakes and cookies in the shape of stars and moons. 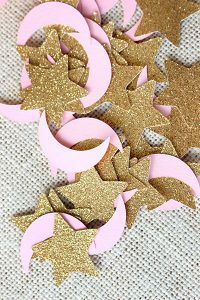 Use moon and star cookie cutters to make these shapes. Cake toppers can be also added to the cupcakes or add some star sprinkles. 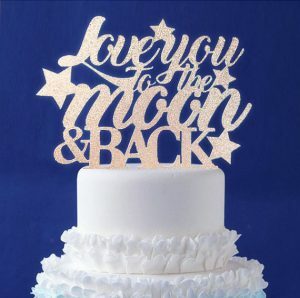 How about this beautiful cake topper – just bake or buy a cake and add this topper to give a pop to it – Or add baby’s name! A beverage dispenser is also a nice addition to your buffet. Don’t forget the matching theme plates and napkins. You can also sprinkle some little stars on the tables for more decoration. The important thing is to have fun and celebrate the arrival of the newborn. Would be glad to hear from you, are there any ideas you would like to share? PS. 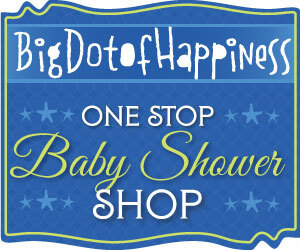 don’t forget to check out top baby shower games! 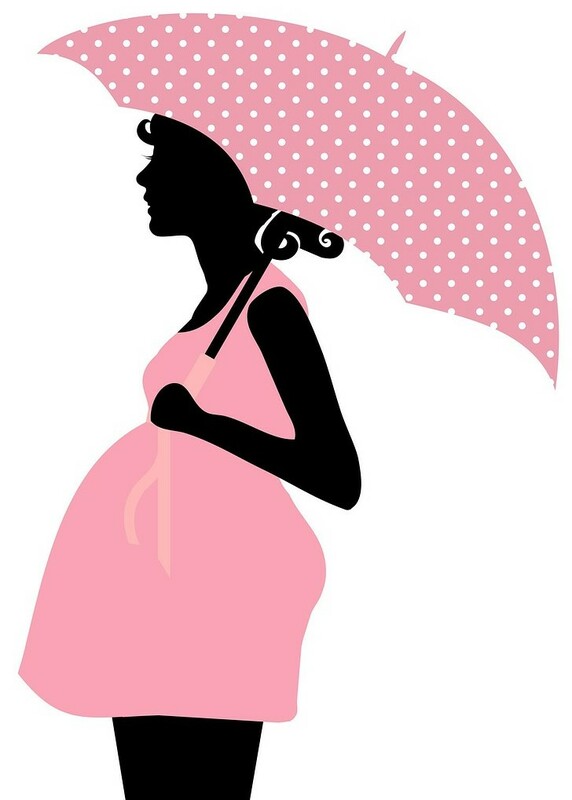 Here is a another baby shower themes for unknown gender. I hope you can use some of these ideas and let me know how it turned out! This entry was posted in Theme and tagged Themes, Unisex. I love this theme, moon and stars. My step-dad used to tell my daughter he loved her bigger than the sky and the water, Made me smile to remember him. Very nice site! Thanks Billie. Glad it brought a smile to your face! Omg!! This is sooo cute! I need to bookmark your page for future reference or if I have another baby. Having to DIY some would be fine because mostly everyone I know is pretty creative. Might be able to find some good stuff on Etsy too. Have you looked around there for anything? I agree Marlinda, DIY is sometimes the way to go when you are on a tight budget. Gather some of your friends and start creatiing! Absolutely love, love Etsy.com!